Ultimate Instant Pot Beef Stew is made in a fraction of the time a stovetop or slow cooker version would take. Tender beef and veggies, in a hearty sauce! We love a good beef recipe that is easy to make during a busy weeknight. 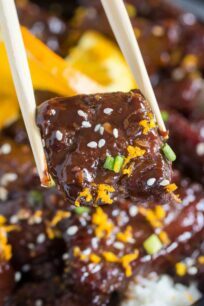 Other great beef option to rotate menu around are IP Beef and Broccoli, IP Mongolian Beef and Pressure Cooker Corned Beef. 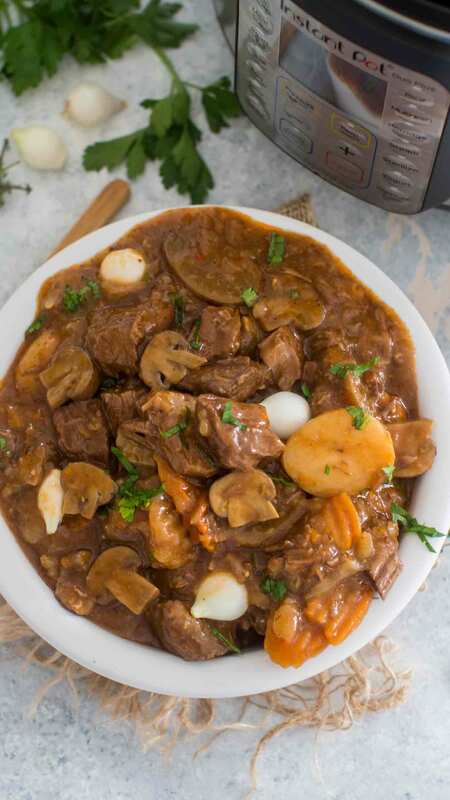 Instant Pot Beef Stew is a delicious and very flavorful homemade recipe, which is perfect for cold winter days! We can probably all agree that Pressure Cooker is like pure magic. It makes meals that usually take hours and hours to cook, in just a fraction of the time. 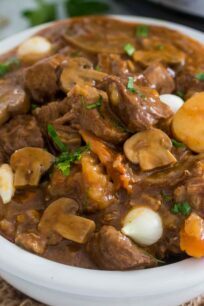 Take this beef stew recipe that usually it would take 8 hours to make using the slow cooker and about 2 hours on the stove top. With the pressure cooker, it’s ready in just over an hour. You have to appreciate the small things in life. Having a fantastic beef stew on the table with little effort is one of the things that rank high in my appreciation book. 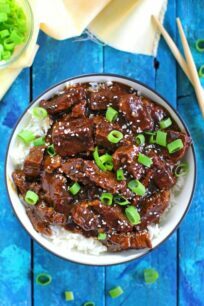 I called this recipe the Ultimate Instant Pot Beef Stew for a reason, it just tastes out of this world. 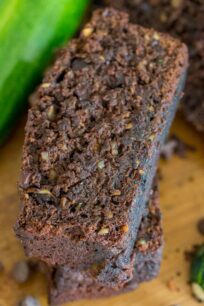 That is not the only perk that this recipe meets: its budget-friendly, it’s hearty and tasty, it’s very, very easy to make with not much prep work. In addition, you have minimum dishes to clean and it makes a LOT of food. Therefore, you can feed a large family or have amazing leftovers the next day. The leftovers heat really well, and the stew tastes even better the next day after all the flavors get a chance to soak in. Start with quality meat, preferably use organic beef for this meal. I used stew meat. Also, look for fresh meat, that has a bright color, and lots of marbling. The marbling is essential to get great flavor and tenderness. Cut the beef into 2-inch chunks if it’s not pre-cut, so it holds its shape well after cooking. In addition, sear the meat first as directed in the recipe! Taking the quickstep to sear the meat instead of just tossing everything it produces a much more flavorful stew. If you would prefer fewer carbs and want to skip the potatoes, you can replace them with celery. Similarly, if you are wondering what potatoes will hold their shape best after cooking under pressure than you need to use Yukon potatoes. I used a tri-color mix potato bag, but they don’t hold their shape as well. I like how they taste and I like the color, but if you are looking for the potatoes to hold their shape than go for Yukon potatoes. You can add red pepper flakes for the dish to be spicier. You don’t have a Pressure Cooker? Not a problem, here is a recipe for Easy Stovetop Beef Stew or Slow Cooker Beef Stew. Chuck Roast: Traditionally, this cut is used in this recipe because it is well-marbled and is super juicy and tender when cooked. Stew Meat: This is the budget-friendly option, and also pre-cut already. So it is very easy and convenient to use. The negative of it, is that you cannot choose the best cuts, so usually, the meat is not the highest quality. So use at your discretion. Ribeye: This cut usually is the most expensive, but worth it. Like chuck roast, the cut is well-marbled and resulting in tender and juicy meat. For tender and juicy meat, we recommend cooking it for 35 minutes of high pressure (the manual setting), plus 15 minutes of natural release. This will result in pieces of stew meat that tasted as if they’d been cooking for hours instead of minutes. Yes, you can absolutely freeze it! We like freezing it in a freezer bag. 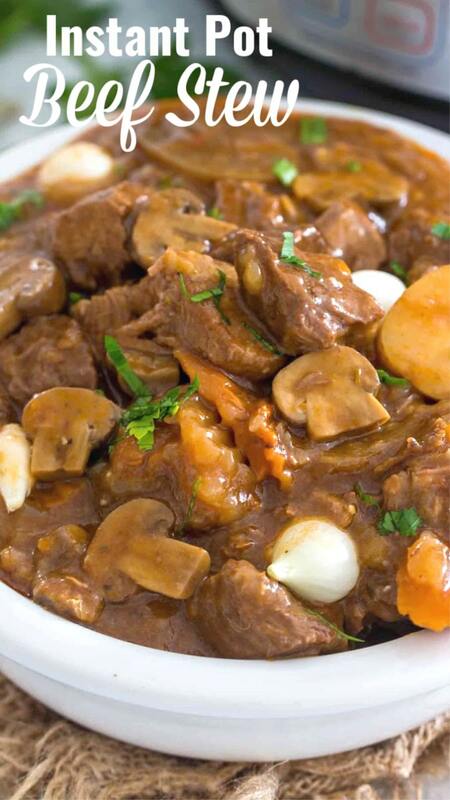 Simply transfer the stew into a freezer bag and freeze for up to 3 months. Similarly, for more convenience, you could transfer it into single serving portion and freeze it. This way, you can take one portion at a time and enjoy it! Best to defrost overnight in the refrigerator before serving. Heat in microwave or stovetop for a few minutes and stir occasionally. This homemade dish is super delicious and flavorful on its own. It is truly a complete meal. However, from time to time we serve it with bread, french baguette or biscuit. It also goes well with mashed potatoes. A Natural Pressure Release means that the pressure is released gradually. For a Natural Pressure Release, you click on Keep Warm, and wait 15 minutes, after which you open the valve and let any leftover pressure to release. Another option is to Turn Off/Unplug the pressure cooker, wait 15 minutes and after that open the valve. A natural release is usually used when cooking soups, meat in a large amount of sauce, pasta or steel cut oats. This method prevents any foam from the dish to shoot out through the valve, which can happen during a Quick Pressure Release. Add the water to the IP to deglaze it, and using a wooden spoon scrape well the bottom of the pot to remove any bits that stuck to it, make sure you scrape it well to avoid burning during cooking. Add the chopped onion and cook for 1 minute, add the garlic, stir and cook for 1 minute. Add salt, pepper, dried rosemary, thyme, marjoram, and red pepper flakes. Stir to combine. Then, add tomato paste, Worcestershire sauce, brown sugar, and beef broth. Stir to combine. Next, add beef back to the pot, followed by chopped carrots, mushrooms, potatoes, and pearl onions if using. Close the lid and seal the valve. Cook for 35 minutes on High Pressure. Once the Instant Pot beeps, do a 15 Minute Natural Pressure Release. If you want the sauce to be thicker, mix corn starch and water in a small bowl until fully combined. With the IP on Saute, add the mixture to the pot and gently stir, trying not to crush the veggies. Cook for 2-3 minutes, until the sauce thickens. This seems like a great recipe. I love that you are very detailed with the ingredients and instruction. But I just wondering could I duplicate it. This seems like a really hearty meal. I have heard so many great things about Instant Pots! I don’t have one but I might have to ask for one for Christmas this year haha. 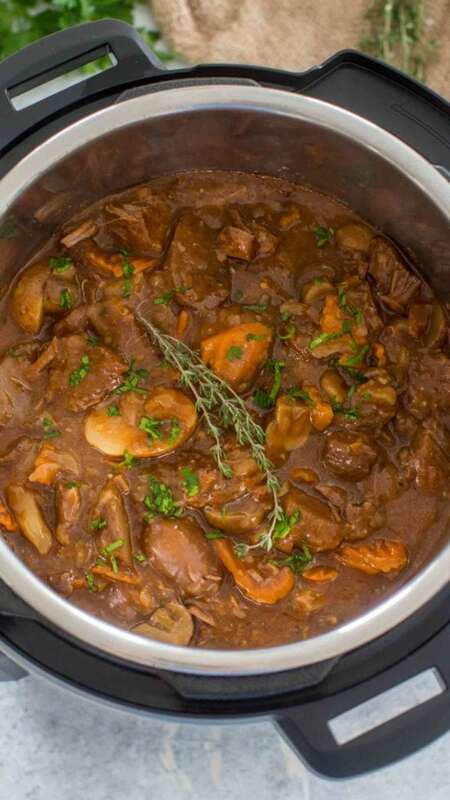 This stew looks so yummy and perfectly hearty for a cold day. My hubby would love it! Instant pots are really good for cooking this kind of dishes. Though we cook rice and veggies as we are vegetarians, we have found instant pots really useful and convenient as compared to traditional pressure cookers. 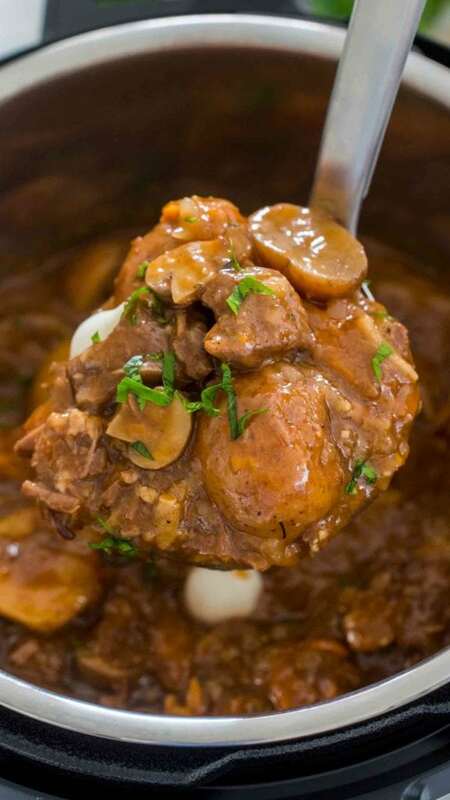 I’ve never put mushrooms in my beef stew, but i love them and bet that tastes amazing. Now I want an instant pot, I think I have one on my wish list. That will really make dinner time easier, because I work all day as a chef, I want to come home to sleep not make more food. It seems like I should invest in an instantpot because it’s a great way to make some hearty meals. While I do love stew beef, I’m not a big fan of mushrooms. Do you have any alternate suggestions? Can you confirm the details on adding the cornstarch slurry? I’m assuming it’s at the end, after the natural pressure release is complete. And then, do we need to have the cover back on the IP for that extra cooking time? Thanks so much! This will be my first attempt at cooking with my brand new IP! I found this recipe on Pinterest. This was amazing!! Great instructions and the stew was so flavorful!! This is a keeper! Plus was able not to “burn” in my ip!! Huge success!! Thanks!! I’m all about that Instant Pot stew. Looks so warm and comforting. You are the instant pot Queen! 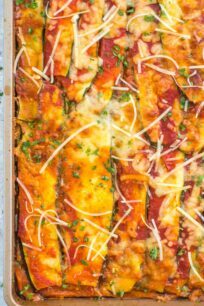 Another fantastic recipe that you hit out of the park! Instant Pot beef stew is the best! Pure comfort food! This is such a hearty and delicious dish! 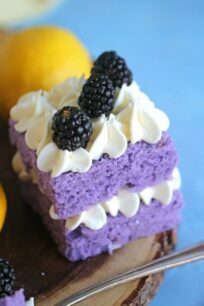 Your recipe is a must try! This is the perfect recipe for my husband, because he loves beef. This sounds like something I need to try. I really like. An interesting mix of ingredients. Thank you! Not sure if I missed something but when do you add the cup of water? Also, I did get the “burn” warning and had to deglase and add more broth even though I did the first step in a saute pan on the stovetop. Not sure what I did wrong but was good in any event. sorry, in step 5 you add the water to deglaze the pot, not beef broth. I have update the step. 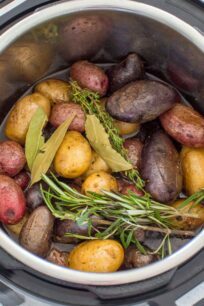 This recipe was great – I especially loved all the fresh herbs!! I used teeny-tiny round potatoes and they were perfect. I can’t eat tomatoes, but it was tasty even leaving out the tomato paste. The only change I would make is to *leave out the sugar*. The stew came out too sweet and the sugar seemed very unnecessary. Thank you. I will repeat this again with minor adjustments! Question: can you use a bit of red wine to deglaze, instead of water? yes!!!!! that will be delicious!!!! 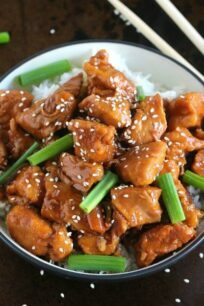 super easy and deliciuos dish. 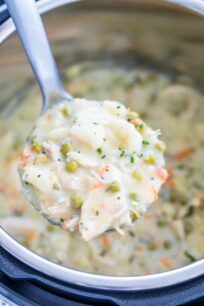 We love a good stew for cold weather, and this one made in the Pressure Cooker is the perfect match. Thanks for this amazing recipe! I made this tonight had to do a few changes due to spices missing. I had to use the Italian Seasoning that had this all combined plus sage. I forgot the celery and didn’t have mushrooms. I only had can vegetables so I used carrots in a can and French style green beans. This stew ws amazingly delicious and very filling. Loved this stew. So happy that you enjoyed it, its a family favorite! I made this stew last night for dinner and it was unbelievably delicious! 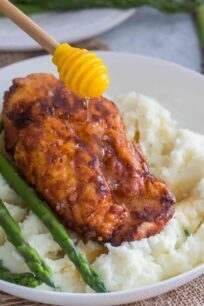 The flavor is great, the directions are simple and complete and everyone at my table raved about how good it was and how tender the meat and vegetables were. This is a 5 star recipe, thank you so much for sharing, I will be coming back to this site for more recipes! Hi Linda, glad you have enjoyed it. Thanks for stopping by!